Find Bamboo Valley Inn deals, discounts and special offers. 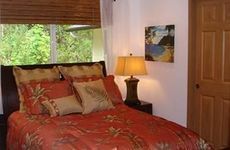 Located on Maui’s North Shore, the Bamboo Valley Inn features suites with fully stocked kitchen and breakfast tray. Our little "Hula Hale" has everything you need for your visit to Maui's North Shore. A private studio with private entrance and bath, as well as a private garden with covered lanai. The ideal home-base for your Maui adventures!